Bemidji State University’s American Indian Resource Center (AIRC) will host a full day of activities to recognize Indigenous Peoples and Treaty Day on Oct. 8. The day will begin at 9 a.m. with a breakfast provided by the AIRC. 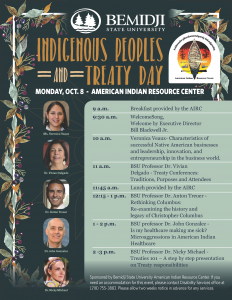 Bill Blackwell, Jr., executive director of the AIRC, will conduct a welcome ceremony to kick off a day of presentations featuring BSU faculty and staff. 9:30 a.m. – Welcome Song; welcome by Bill Blackwell Jr., executive director of the AIRC. The American Indian Resource Center (AIRC) at Bemidji State University is a place for students to learn and gather in the rich culture and tradition of the Anishinaabe people throughout the Bemidji area and around the world. The AIRC supports American Indian students at BSU by connecting them with local resources, people and opportunities to enrich their professional and personal lives.